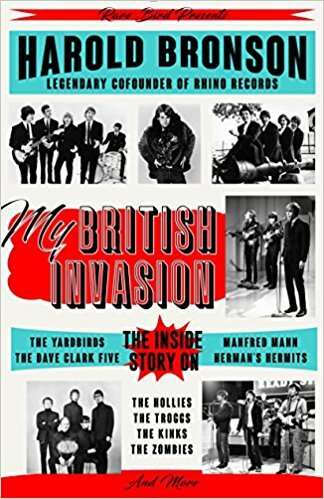 Harold Bronson, co-founder of Rhino Records, rock and roll writer, musician, and pretty much a late 60’s/early 70’s rock and roll diarist and historian, lays everything you ever wanted to know about the music of his generation in his latest, My British Invasion. Learn facts of classic British Invasion bands like The Hollies and The Kinks, sit next to Bronson has he takes in concert after concert at historic L.A. venues, ease drop on his conversations with the biggest of the bigs at that time of classic rock and pop. Bronson is a super fan, this fact is at the heart of this book and what makes it work so well. He’s not name dropping to name drop or relating facts to show you how well informed he is (and he does know his stuff, that’s for sure.) But he tells us what he does in My British Invasion because he wants us all to understand the importance of this particular era of music that came before and how, at one time, this music was the most important popular music on the planet. Harold Bronson’s My British Invasion gives us all a much-needed history lesson none of us should soon forget.